Esther is a very lucky girl, in that she has made it to her class 8 studies at Nguo Primary School all the way from the minority Turkana community. She was the last born to a single mother of 8 children total. Unfortunately, her mother died in 2011, and she was left without any form of support. It was her auntie who stepped in and helped, though she had her own children to take care of. Of course, the 8 additional mouths to feed were a huge burden on her aunt, and she was unable to put any of Esther’s older siblings through secondary school. Esther worries that she will face the same fate when she finishes primary school. Academically, Esther is doing fine, although she is uncertain of her future and probability of joining secondary school. She is an average student and scored 310/500 marks on her recent exams. An interview with her demonstrated her desire for education and to improve her future. She promised us that she would get no less than 350 marks on her KCPE, and hopes to be a lawyer if a chance to finish her education is offered. Our mere presence in her home and school seemed to inspire her and gave her lots of hope that she would qualify for our program. 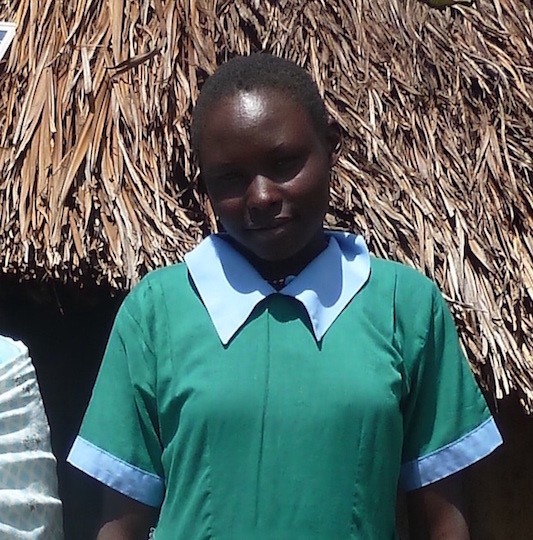 Esther demonstrates strong leadership skills for her young age; she is currently the lead prefect for her school. She also loves track and field, and has even represented her school at the sub-county level in long races. Esther is optimistic that help will come her way to join high school. Be that help that Esther longs for; sponsor her education today!